Hugo Harris in Student Life on 2 December, 2015. Times Higher Education (THE) league tables have revealed that Durham is 36th in the world for Social Sciences. This marks a rise in 20 places for the faculty since 2014–2015. Professor Tim Clark, Pro-Vice-Chancellor and Head of the Faculty of Social Sciences and Health said: “This rise in our rankings for Social Sciences is testament to the world class excellence of research and teaching that takes place within this field at Durham. I am delighted for all our staff who have contributed to this achievement as part of a collective effort across the disciplines.’’ Nevertheless, Durham University still trailed many other British Universities. The University of Manchester pipped Durham to 34th place, whilst the University of Oxford came fourth. America remained the best in the world, with MIT, Stanford and Princeton taking the top three spots. Durham were also ranked 83rd for physical sciences, with American Universities again dominating the higher rankings. Durham University’s Ogden Centre for Fundamental Physics was put in the spotlight this week after cosmologist Carlos Frenk gave a wide-ranging interview for The Guardian. Speaking about the decision to open the original Ogden Centre in 2002, the scientist noted that “Using any metric or measure you want… the building had a huge effect on our productivity”. He went on to add that the second structure currently being added to the complex (slated for completion in autumn 2016) will reflect his discipline. “If you weren’t a scientist you’d still get a sense of what we did when you walked in… you’d know this is about space.” It will accommodate the Institute for Computational Cosmology (ICC) and the Institute for Particle Physics Phenomenology (IPPP) and cost £11.5 million. Its architect, Daniel Libeskind, designed the masterplan for Ground Zero, New York. Professor Tom Ward, Pro-Vice-Chancellor (Education) at Durham University in May said the building’s ‘‘unique design will make an important contribution to the architectural heritage of the University and Durham City”. Numerous pre-planned police strikes were carried out across the north of England on 26th November in what was named ‘Operation Zephyr’. The raids related to an ongoing feud with the traveller community on sites close to West Rainton, Gateshead, York and Doncaster were led by Durham Constabulary and involved four other forces. Property and vehicles were seized along with two sub-machine guns and ammunition and it was later revealed that out of the seven arrested that day, one was arrested on suspicion of conspiracy to destroy or damage property. Det Supt Adrian Green of Durham Constabulary, who is leading the investigation, was keen to stress that ‘‘this was a targeted response in relation to the actions of a small number of travelling families’’. This news comes just over a week after two skulls were taken from a cemetery grave near Ferryhill in an incident police believe to be connected to individuals within the traveling community. Durham University’s environment team has been presented with The Green Gown Award for ‘Continuous Improvement: Institutional Change’ by the Environmental Association of Universities and Colleges (EAUC). After the Awards Ceremony in Bristol, the European Green Capital for 2015, Professor Tim Burt, Dean of Environmental Sustainability at Durham University, said: “Winning this Green Gown Award recognises all the hard work over the last few years. It highlights the vital work Greenspace does, especially its communications and campaigns, and rewards Greenspace staff for their commitment, expertise and enthusiasm.” The University’s submission, entitled “Greenspace – Branding the Message ‘Every Small Step Leads to Big Change’”, highlighted Greenspace as a vehicle for change in all areas of the University’s Environmental Sustainability Policy. 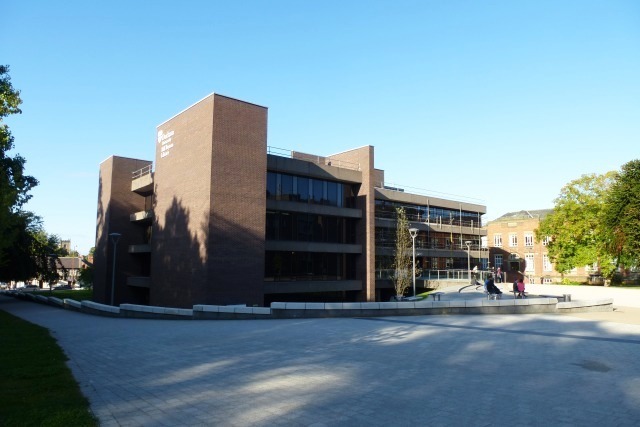 The adjudicators said they “were particularly impressed by the brand and narrative the University has developed and the increasing penetration of the Greenspace agenda into faculties and departments”. A fire in Newcastle City Centre burned for more than five hours on Tuesday before fire fighters were able to get it under control. More than fifty fire fighters attended to the blaze at the Kard Bar poster and print shop on Cross Street, and three roads were closed and nearby buildings were evacuated. It is feared that one person was trapped on the upper floors of the building and died.